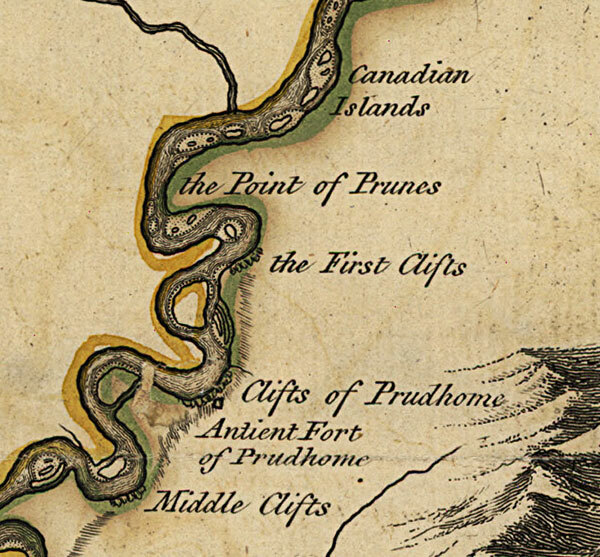 Survey of the lower Mississippi River by the British: Based on an earlier survey by the French. 1765. If I'm interpreting the MARC record correctly, this was actually illustrated by a Mr. Robert Sayer, and is based on surveys conducted in 1765 (themselves updates of earlier French Surveys) by one Lt. Ross of the 34th regiment. As the map's title says, the map depicts the "Course of the Mississippi from the Balise (La Balize) [google map] to Fort Chartres (Fort de Chartres) [google map]." I'm far from an expert in these things, but the timing and the subject matter seem to indicate to me that these surveys must've been related to Treaty of Paris. Past that, I'm out of my depth. If you're a historian of this era and would like to shed some light, I'd love to hear it.